Australia - Establishment period: 1917-1923. Ordinary rate delivery form AE-DO-1. Heading and notes: Form number E.T. No. 2 (but not printed on the first three formats). Combined form and delivery envelope format. Colours (text & form): Black on green (but many variations of green). Size of form overall: 188 × 201 mm. Size of datestamp box: 26 × 22 mm (3rd format only). 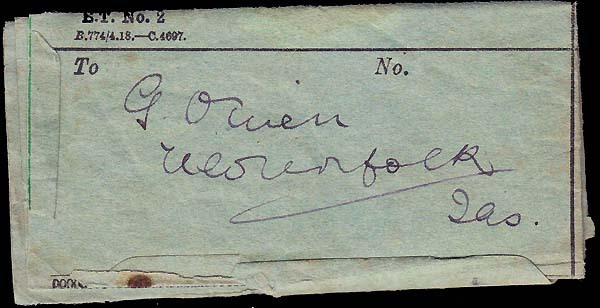 1E: "Date Stamp" on the left side just below TELEGRAM. The first delivery form issued under direct Commonwealth PMG authority was trialled in 1917 as an experimental design combining a delivery form with a delivery envelope. Such combinations had been used in various European countries albeit with a very different design to that trialled by Australia. The intention was to eliminate the printing and duplication of work required using separate envelopes. The trials of the first two formats appear to have been restricted to New South Wales and Western Australia. The form was folded along printed lines and then sealed with gummed tabs so that the message area was completely enclosed. It was opened by tearing along the gummed tabs - not always an easy task. The folded form was very small - see below. Urgent rate forms with the same design were also printed. TELEGRAPH: Combined Form and Envelope. 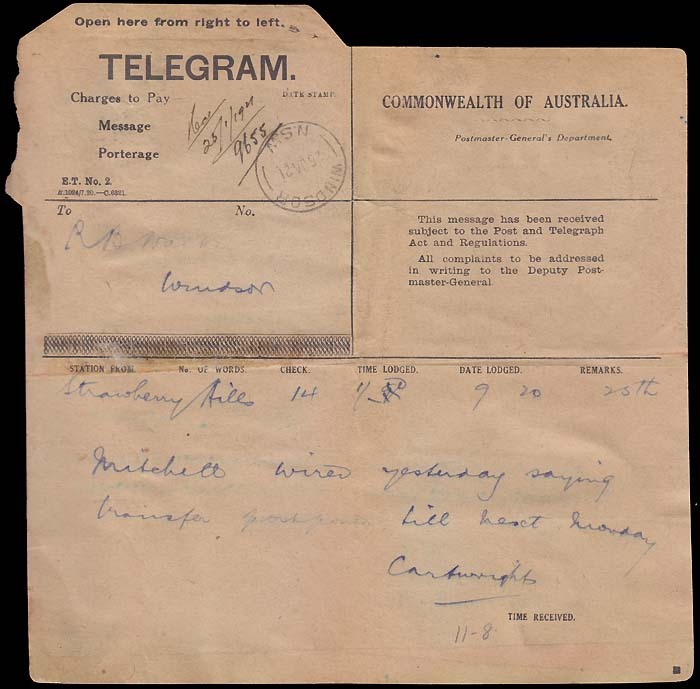 Approval has been given that the use of the combined telegraph form be extended to all offices throughout the Commonwealth, but the existing supply of forms and envelopes should be used up to prevent waste. recipients found them difficult to open without damaging the message or the form in general. "Convenience or economy as represented in the telegram — or 'puzzlegram' as it is facetiously termed by flippant critics — was the subject of passing reference in the House of Representatives on Wednesday. Mr. Higgs (Q.) 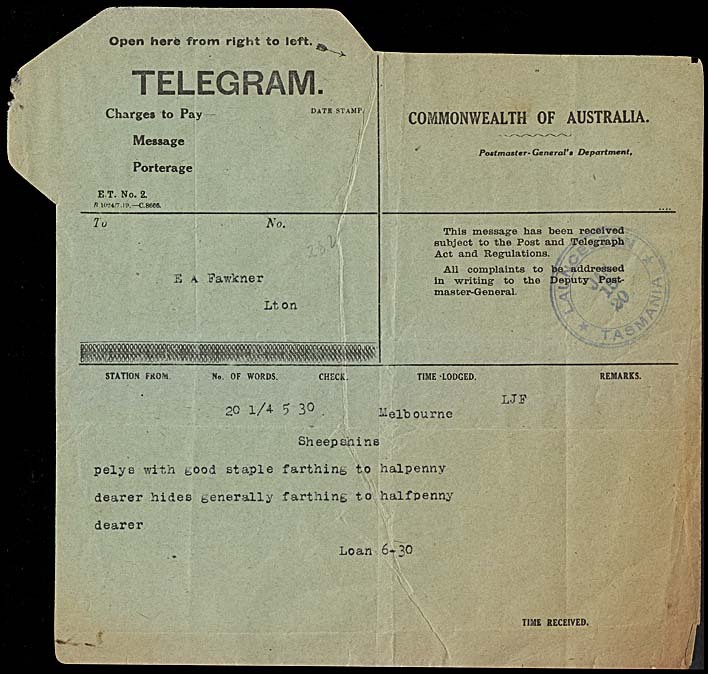 desired information as to when the ridiculous folding telegram form produced through the genius of Mr Webster was to be abolished and another form substituted whereby the taxpayer might have a reasonable chance of reading the telegram when he received it. The Postmaster-General, states the Age, assumed an air of calm indifference. Further provoked by Mr. Higgs, however he protested that the telegram form at present utilised represented a saving of £7000 a year. "And the loss of 7000 souls" said the Queensland member". In the Federal Parliament sitting of the House of Representatives on 21 April 1920, Dr. Earle Page (N.S.W.) was "informed ...of the suggestion that the use of envelopes for telegrams be reverted to". ... it is hereby notified that it has been decided to discontinue the use of the combined form and envelope when the present supplies are exhausted, and revert to the previous system. 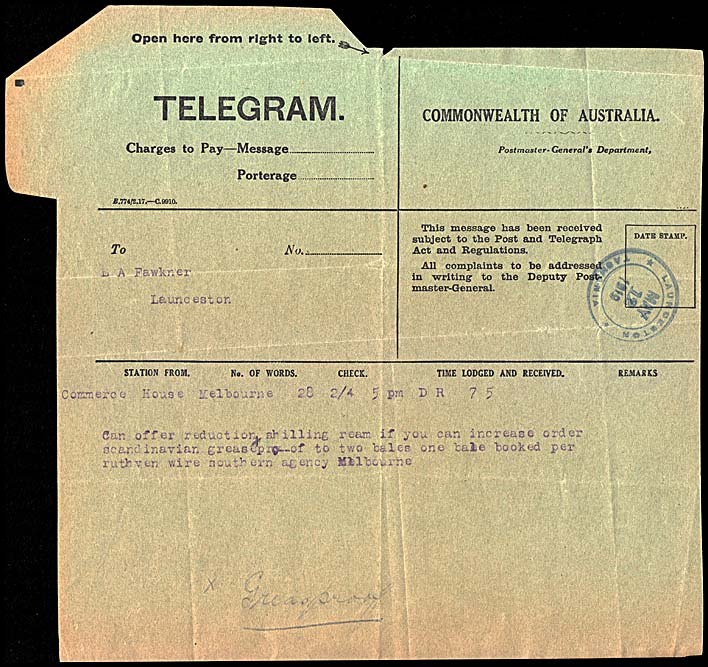 "End of Self-folding Telegram Form. Instructions have been issued by the Postmaster-General that, as soon as the supply of forms at present in stock has been exhausted, the old system of dealing with telegrams for delivery is to be reverted to. 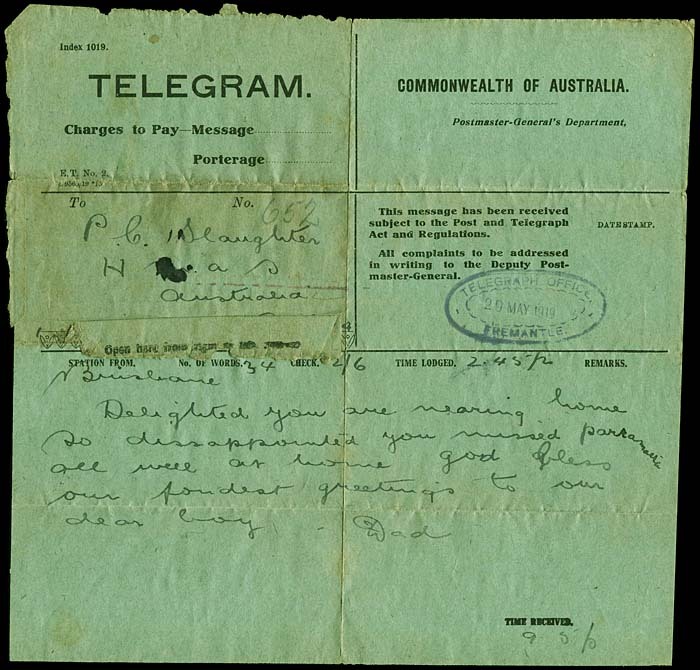 The now well-known green, self-folding forms were introduced as an economy measure, but it is considered that the saving effected, if any, does not justify the inconvenience caused by the folded telegram. Experience has prompted the decision to revert to the former system of a plain telegram form and an envelope". No image yet available. AE-DO-1A. has Print number 25934 and St 7427 in lower left corner. This form may have been trialled in NSW. Brisbane to H.M.A.S Australia at Fremantle, WA. Has rare rubber oval TELEGRAPH OFFICE date stamp of Fremantle. L 9563/19 15 (below the Form number). This form may have been printed and trialled in Western Australia. See also the reference in the Table at the base of this form for AE-DO-1D where this is another form included for HMAS Australia. Has type 2A (iv) rubber date stamp which is rated RRR. words at top of message area have "TIME LODGED AND RECEIVED"
printed in black on dark green paper. Printed in April 1918. AE-DO-1D. printed on dull green or blue-green paper. Printed in April 1918 (and with same schedule number as the previous form). AE-DO-1D. Quarantine Station to New Norfolk (26 July 1919). Folded to demonstrate the appearance. This is the version printed on blue-green paper. Has type 2A (v) rubber date stamp which is rated RRR. has "TIME RECEIVED" in the lower right corner at the base. Printed in a range of shades from light green to green-blue. 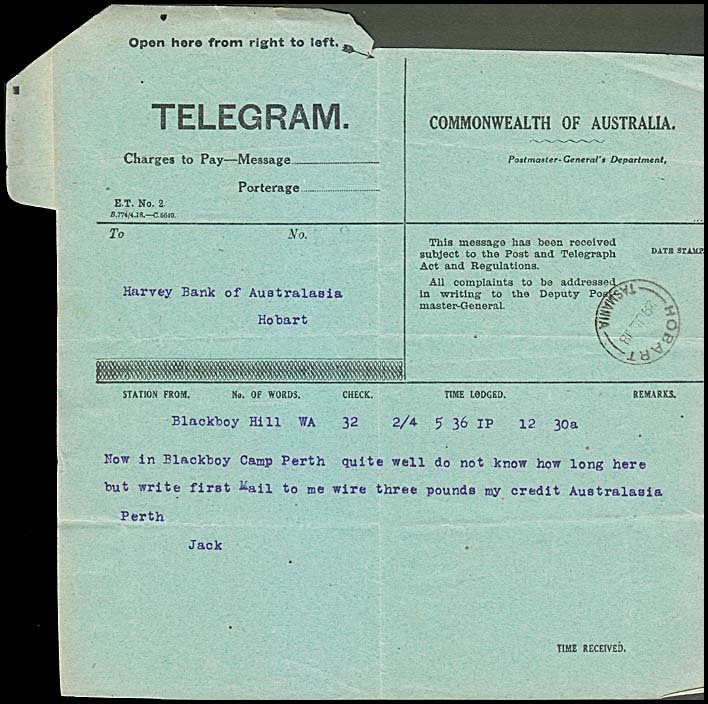 Strawberry Hills to Windsor, NSW (25 January 1921). printed on thick brown paper. Given the schedule number is the same as for DO-1Ea and the date of use, this form may have been printed on different paper at the end of printing because the usual paper stock had been exhausted. Only three examples of this type have been cited (see a Kalgoorlie date stamp - with North removed - for a second example). Overview for Australian ordinary rate delivery forms?